[XPB-SA49] Stainless Steel Security Shelf is fabricated of type 304, 14 gauge stainless steel in architectural satin finish. 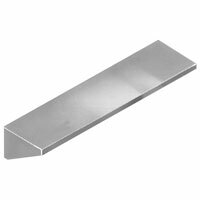 All welds are ground smooth, with polished corners and burr-free edges. The back of the shelf has welded anchor nuts to receive threaded studs. Please specify wall thickness and choose a wall type. Specifications and additional details available by request. For shipping quotes, orders or questions please call our Customer Service Center at 1-877-483-9270.